Has One Of Tiffany and Company’s Trademarks Become Generic? Tiffany has been in the jewelry business since 1886. It holds 97 trademarks that relate to its company name “Tiffany”. Tiffany and Company and Tiffany NJ LLC (“Tiffany”) sued Costco Wholesale Corporation (“Costco”) in the Southern District of NY alleging trademark infringement, dilution, counterfeiting, unfair competition, injury to business reputation, false and deceptive business practices, and false advertising. See Tiffany & Co. v. Costco Wholesale Corp. No. 13-CV-1041 (S.D.N.Y. Feb. 14, 2013). 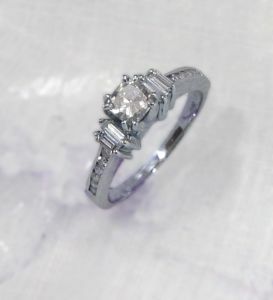 Costco counterclaimed arguing that the terms “Tiffany” and “Tiffany Setting” are generic words for ring settings that have multiple prongs shooting upwards from the base of the ring to hold a single gemstone (a particular setting type). Costco further asserts that Tiffany has no right to prevent Costco or any other third party from using the term “Tiffany” in its generic or descriptive sense. Tiffany alleges that Costco is using the TIFFANY trademark in the descriptions of two rings to sell diamond engagement rings. These rings are not manufactured by Tiffany. Tiffany argues that use of the TIFFANY mark in this manner is illegal. The jewelry manufacturer and retailer moved for summary judgment seeking dismissal of Costco’s counterclaim. The Tiffany registrations that are relevant to this dispute are U.S. Registration No. 1,228,409 TIFFANY in International Class 014 for jewelry and other goods and U.S. Registration No.133,063 for the stylized mark TIFFANY for jewelry and other goods. Tiffany further alleges that it refers to one style of engagement rings as a TIFFANY setting ring (a six prong setting that holds one diamond). The USPTO registered these trademarks and as a result, there is a presumption of validity for Tiffany. This is one of many advantages of filing your trademark on the Principal Register . This places Costco in the position of having to overcome the presumption that consumers perceive the mark as inherently distinctive. Trademarks are evaluated and are categorized based on the strength or weakness of the mark. The scope of protection given a trademark depends on whether it is considered inherently distinctive. Generic terms cannot function as trademarks. See Trademark Manual of Examining Procedure (TMEP) §1209.02(b) where it states that a claim of acquired distinctiveness cannot overcome a generic refusal. This is because generic words are understood by the general public to refer primarily to the category of goods or services and does not distinguish the products or services on the basis of source. Essentially, Costco is alleging that the public has appropriated the terms Tiffany and Tiffany Setting as a means to refer to all rings with a particular setting type. This is commonly referred to as genericide. A trademark can fall victim of genericide, if there is popular usage by the relevant public to refer to the general class of products or services. In these circumstances the trademark has unfortunately evolved into a common noun and trademark rights cease to exist. Examples of brands that almost became generic were BAND-AID and KLEENEX. The companies that owned these trademarks conducted aggressive educational campaigns to inform their consumers that the brands should be regarded as source identifiers and not common names for the goods. Examples of marks that have lost their trademark protection due to the terms becoming generic are aspirin, escalator, and zipper. If you looked up these words in the dictionary, you will find a definition. Dictionary definitions are one of several factors considered when determining if a term is generic. Costco submitted the following evidence in support of its counterclaim that Tiffany is a generic term for a particular setting type or style of engagement ring: (1) examples from publications of the generic use of the words Tiffany setting; (2) examples of consumers’ generic use of the term Tiffany setting; (3) examples of jewelry manufacturers’ and retailers’ generic use of the term Tiffany setting; and (4) dictionary definitions of Tiffany and Tiffany setting. On January 17, 2014, after reviewing the evidence, the Southern District of New York determined that there was sufficient evidence to raise a factual dispute as to whether Tiffany and Tiffany setting has a primarily generic meaning for a type of ring setting in the minds of consumers. Costco’s counterclaim will not be dismissed and Costco will be allowed to proceed with attempting to prove its case against Tiffany for genericness. If you are concerned about your trademark becoming generic, please feel free to contact one of our NY trademark attorneys for a courtesy consultation. If you are a trademark owner, we will leave you with a few basic guidelines. To avoid the risk of your trademark becoming generic, select a distinctive trademark, use your trademark as an adjective and not a noun or a verb, ensure your trademark term is used in a manner to set it apart from the surrounding text (such as using the trademark term in all capitals, use a different color font, or use larger size lettering for the trademark term), use the ® symbol with the trademark, and lastly monitor the marketplace and take appropriate action against third party infringement or misuse of your trademark. Tagged: How Trademarks Become Generic and Tiffany & Co. v. Costco Wholesale Corp.